A small kitchen is something that so many of us have to contend with. Luckily, there are SO MANY creatives solutions to create space where there was none and to organize lots of stuff into an area too tiny to hold it all. I have listed out just three of my favorite “small kitchen” hacks on the next page and I hope that one of them–or more than one–is perfect for you! Not a new idea. My parents did this 50 or so years ago. 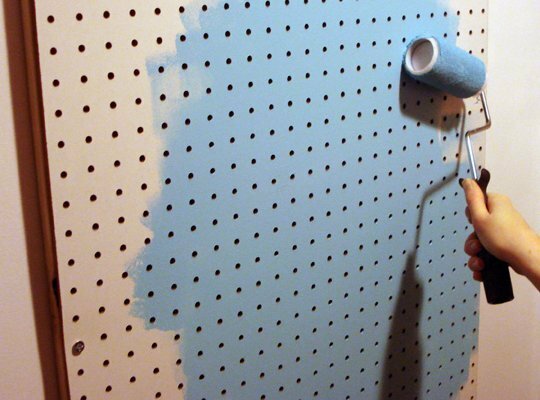 I have used pegboard in my kitchens for years for lots of thing. Easier to find things than all jumbled up in a drawer. I haven’t looked yet, but I have one in my kitchen, with my pots and pans on it. I painted it red. I love it. I liked the idea for a shelf as a table in a really small space, with some adjustments it could be made into a beautiful practical idea . It’s not genius. it’s nice, but it’s not “genius”. that’s what i wanna do….does it work good? Dork I was thinking there would be less room for piling without the table! Julia Child’s Kitchen, was organized in this way with pegboard.